THQ Nordic has announced the lineup of games it is bringing to Gamescom 2017 in Cologne, Germany later next month. Elex – The short breakdown: Journalists and players alike can look forward to playing a near-to-final version of Elex, the open world RPG from Piranha Bytes. Coming to PlayStation 4, Xbox One, and PC on October 17th. Battle Chasers: Nightwar – Battle Chasers: Nightwar was nominated for the “Best RPG of E3” award and is shaping up nicely for its multi-platform release on October 3. For the first time, you can get your hands on the game on the Nintendo Switch. SpellForce 3 – The multiplayer beta of SpellForce 3 is now running and has already seen thousands of players contributing providing valuable feedback to the development process. At Gamescom, the focus will be on SpellForce 3’s deep single-player campaign. Aquanox: Deep Descent – First-person underwater shooter Aquanox: Deep Descent will show its campaign for the first time to journalists and players alike. The Guild 3 – For The Guild 3 you cannot only expect to see an improved version and advanced gameplay, but we will also have a surprise announcement to make. Wreckfest – The recently announced cooperation with Bugbear Entertainment for Wreckfest allows the game to make a pit stop at gamescom where it will show off a raft of new content for upcoming updates. New Announcement #1 – The first new announcement is a brand new original IP. This open world RPG is set in a unique universe and will be a post-apocalyptic kung-fu fable. New Announcement #2 – The second new announcement is a new instalment of a well-known, mysterious and horrific IP. Gamescom 2017 runs from August 22 to 26. I'm guessing this isn't the same THQ that closed down? 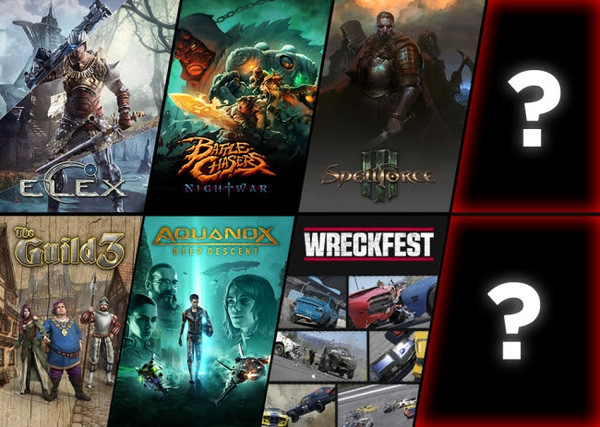 Nordic Games (A European publisher of western RPGs and other things) brought the THQ name and about 2/3 of their old IPs and are doing Darksiders 3 etc. Battle Chasers?!? How long has that been around? This is the first time I've heard of it! Impressions on it have been good. It's a classic style RPG. But it's long since i lost interest in the series. Given how Madureira used to make the longest hiatuses. I remember starting the series. Still have some of it stashed away in the attic. I didn't know they were making a game based of it though. Preorder is $25?!? I believe it started off as a kickstarter game.